Some books are designed for a mass audience and these are frequently works of fiction. Most nonfiction books (as this work is) unfortunately, appeal to a smaller readership. Then there are the NNT’s [nonfiction niche tomes] that intend to make a strong point to an even narrower group. It is unclear whether the author had the second or third category in mind when he wrote Dangerous Times, but it is definitely a niche reader who will understand and appreciate this work. Specifically, his linguistic style and scholarly word choice will eliminate many, if not most, casual readers. Add to this the depth of justification for each and every point he makes and, unfortunately, many who could learn from this work will probably never read it. With the potential audience reduced, the message of major World War is obsolete will be slow to reach the masses. The subtitle gives a clear indication where the book intends to take the reader. This book is an intellectual argument for peace. Not idealistic, we-all-hold-hands peace, but rather a no-more-great-wars peace. If this is correct we are on the right path. However, if the author desired to reach a larger audience, the subject might have been handled with a different, more engaging/less academic writing style. The author is not hoping for the outcome to be as he wishes, but a logical conclusion to his research, and that of others he frequently references. A large portion of every chapter draws key points and quotes from the published works of others. A strength of the book is its detailed Notes at the end of each chapter referencing these other published works and authors. This is more a dissertation than a typical work of nonfiction. The author starts by explaining that Norman Angell was misunderstood and misquoted regarding his purported position on war being improbable. Fettweis goes on the correct this by restating Angell’s position as to the futility of war. He develops his hypothesis from here. The book is divided into three parts: Theory, Evidence, and Implications. Part One Theory focuses on behavioral changes that are needed and may have occurred in order to eventually lead to the books desired conclusion. Part Two continues with the argument that behavior has changed, therefore, our actions will change. The point is further stressed in Chapter 5 when the idea of wars over natural resources is debunked. During the cold war, Fettweis argues, the world was influenced by a duopoly. Namely the U.S.S.R. and the U.S., yet major war did not break out. The post-cold war era brought the world a uniopoly: the U.S. This has led the U.S. to feel obligated to “save” the world. Curiously, Part Three, Implications, focuses significantly on the United States and the lack of the need of a Grand Strategy. 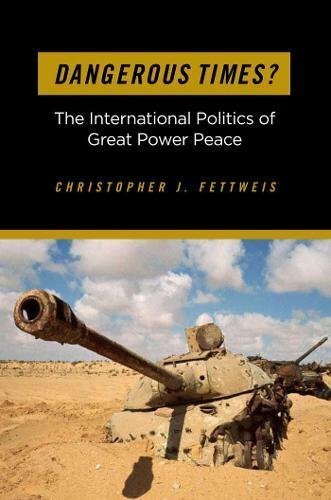 Particularly in Chapters 7 and 8, Fettweis makes the detailed argument that the U.S. does not need to save the world. The world is on the path to saving itself; at least from International World War. So a book that starts out with an argument to prove the world is becoming a safer place (using current statistical data) with reduced terrorism and fewer warring nations than in the past, evolves into an argument for the U.S. to stop acting unilaterally. The U.S.’s aim to decide what is best for everyone else in the world so that the horrific consequences of major war can be avoided is unnecessary. Not that it should return to the pre-1940s isolationism, but to a neutral stance of operating a solid partner in the world market. An example of this is the continuous contrasting of the Neorealist views with that of the Constructivists. With the inclusion of a detailed index, Fettweis has created a legitimate reference for many a fruitful discussion between individuals that were neither.